Chairs. A fully equipped kitchen and an in-room washer and dryer make this your ideal choice for either long or short term vacation rental. For the golfers there are two 18 hole golf courses just minutes away, the Kolina Resort and the Makaha Valley Resort, said to be two of the best on the island. 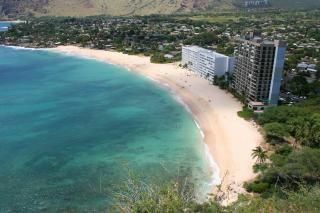 The world famous Makaha surfing beach is less than a mile away and home to many International Surfing Competitions during the winter months. For you fisherman, take a deep sea fishing excursion from the Waianae harbor which is about 5 minutes down the road. Free local and long distant to many locations, try it to see if you can connect to the destination of your choice. Central Air in unit, requires condo to be shut up tight to be effective, Trade Winds more effective with exception of summer months. Fully Equipped, including: Coffee Pot, Blenders, Rice Cooker, Pot & Pans, Toaster, Cooking Utensils,. Some books available in condo and additional in Princess Lobby. We try to provide some snorkeling gear but do not guarantee its availability. Tennis court on property with rackets provide in condo. The condo does not have any special accommodations for wheel chairs however the building is equipped with two elevators to get quest to the floor of the building the condo is located on. Great property, would definitely stay here again !! Paradise!! The condo is absolutely perfect, clean and cozy! Everything I needed ( beach chairs,coolers, beach umbrella etc) was there! The view was spectacular, the beach gorgeous!! I really enjoyed my stay !! We loved being on the south side of Oahu away from the hustle and bustle of Honolulu. The condo was well-equipped with whatever we needed. The view was spectacular; the constant sound of the waves was totally enjoyable. It was peaceful in the mornings sitting on the lanai and looking at the ocean. In the evenings, the sunsets were amazing. We thoroughly enjoyed our stay at the Hawaiian Princesses. Wonderful views from a great condo! We thoroughly enjoyed our stay at Steve’s condo. The lanai is perfect for watching the waves come in and I was able to see sea turtles nearly every morning while drinking coffee. Everything you could need is here, all the way down to a box fan (I have to sleep with a fan on for the noise so when I saw there was one I was elated!) We loved the location because it was more private than the crowded beaches of Honolulu. With that being said though, if you’re a picky eater, most of the nearby restaurants are either fast food or local spots. Don’t expect to find a Chili’s. :) It worked out great though because there’s a grocery store 5 minutes down the road and a Long’s Drugs (CVS) that’s walking distance. Security was also great here and I left the top off of the Jeep the entire time and was never worried. My only regret is that we didn’t stay longer. I could have spent another week just snorkeling around the condo! I highly recommend the Hawaiian Princess and this condo! We enjoyed our stay here. The AC worked fine at night when we wanted to sleep, but we mainly used the windows to keep things cool. There were several spices and condiments available to us, and the washer/dryer were quite valuable to us. There were plenty of beach gear and equipment to use, such as many folding chairs, boogie boards, and some sand castle play toys for my youngest daughter. The decor was pleasant, and the fold out bed worked well for our daughters to sleep on, who enjoyed sleeping next to the sliding glass door and the sound of the ocean. We thoroughly enjoyed our stay in the condo! The ocean front location is fabulous. Just fifty feet to the waves. Sea turtles swim by regularly. Morning coffee on the lanai watching the waves, ocean swims and beautiful sunsets from the balcony. The beach is big and easy to access. There’s good snorkeling close to the shore. We loved the pool and hot tub too. The unit was super well-stocked, comfortable and the owner is very responsive and let us know everything we needed to get settled and feel at home when we arrived. There’s all kinds of beach accessories, chairs, umbrellas, snorkeling gear, boogey boards and more. The unit has air conditioning, and there’s a wonderful breeze that blows through when you open the lanai doors and there are ceiling and floor fans in the rooms to keep things cool too. Good supermarket in Waianae a little before you get to the condo (Tamura, on the right hand side) to get groceries. We will stay here again, but next time for longer. Nightly Rate: $140 Weekly Rate: $980 Monthly Rate: $3650 for 28 day or longer except high season Please contact owner for current rates and availability. Monthly rentals drastically reduced.